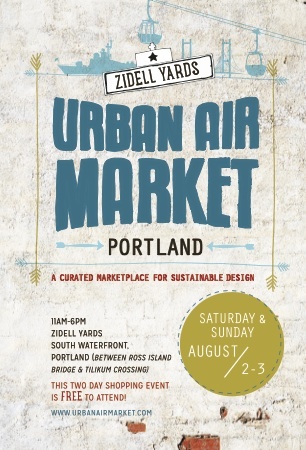 July 2, 2014 - PRLog -- Urban Air Market, the favorite outdoor sustainable market from San Francisco is launching Urban Air Market - Portland: a two-day event that will take place from 11am -6pm both Saturday, August 2nd and Sunday, August 3rd. Bringing together the creative communities of Portland and San Francisco, this free event is a pop-up marketplace for sustainable design featuring 100+ emerging and established artisans and brands, along with live music, art installations, food vendors and a beer garden. This two day pop-up event will be held at Zidell Yards, a former industrial shipyard located in the South Waterfront neighborhood set beside the Willamette River and Ross Island Bridge. Plans are underway to transform the 33-acre site into Portland's next great neighborhood, and a host to public parks, plazas, and river access. Urban Air Market is proud to be the first outdoor shopping event to activate the space. The first 150 attendees to RSVP will receive a free canvas tote bag on arrival. To RSVP or to apply to be a featured Urban Air Market designer, please visit www.urbanairmarket.com. Driving South on I-5 Take Morrison Bridge exit and then Naito Parkway south. Turn left on Market into Harborside area. Head toward I-5, but take Sheridan Rd exit before getting on I-5. Then turn left on Sheridan, right on SW Moody. Urban Air Market will be on your left toward river. Now in their 10th year, URBAN AIR MARKET remains the curated marketplace for sustainable design. Participating designers are selected based on their quality, originality, cleverness, and method of sustainability in design. Formally known as Capsule Design Festival, Urban Air Market offers consumers the ability to discover emerging designers while supporting their local economy.